I am fond of telling my great grand children that when and where I grew up, there were no mobile phones (in fact, we had no phone at all), there were no computers, and for a long time, there wasn’t even a radio because neither my grandparents or I spoke English. I was born in America, but English was my second language at least until I entered school. My exposure to “the media” consisted of rare but wonderous occasions when my aunt took me to “The Rex”, the local movie theater, to see “cowboy movies.” These movies gave me great pleasure, but they could never compare to the sheer delight that watching “The March of the Wooden Soldiers” gave me. One of my Aunts had moved to Jersey City, where she bought her first black and white TV set and became obsessed with watching it. One Thanksgiving when I was seven or eight years old, I went to visit her and my other relatives who worked in the factories and on the docks of Jersey City. It was there and then that I watched TV for the first time, and one of the first things I saw was Hal Roache’s “March of the Wooden Soldiers.” It immersed me in a magical fantasy world that I never wanted to leave, and I was filled with a deep sadness when the movie ended. For some strange reason, the other day when I lay cozy under my blankets and watching the snow fall outside my large window, I thought of that movie and the feeling it still evoked in me. I found it on Youtube and watched it once again. Watching it now, as an old woman filled with a lifetime of education and experience and resting deep in the wisdom of my years, I saw in the movie what I could not have seen or consciously understood as a child: the problems of a single mother with many children, the cruel and selfish greed of her landlord, the relationship between a boss and his factory workers, sexual harassment, and a woman forced into compromising herself in order to save the people she loved. Then there was the army, the wooden soldiers come to life to destroy the monsters who threatened the people. It was all there, obvious as could be. Let me tell you a little about the story before I move on, so you can understand what I have said above in context. The movie opens with “The Little Old Lady who lived in a shoe” “who had so many children she didn’t know what to do” sending her children off to school. The last out the door is “Little Bo Peep” the one who continuously “lost her sheep and could not find them.” The old woman then begins to bemoan the fact that she has no money to pay her rent, and that the landlord will be sure to evict her. When the landlord, played by Harold Lloyd, enters the scene, it is to sexually harass the beautiful Bo Peep. Reaching out to fondle her, he asks her to marry him and when she refuses, he swears that he will force her to do so. He then goes on to The Old Woman in the Shoe, and reminds her that her rent is due, and that he will evict her if it is not paid. Of course, she has another option, which is to give him Bo Peep in return. The Old Woman refuses to trade Bo Peep in order to stay in the home, and begins packing to leave. It is then that two bumbling but kind and noble fools in tattered clothing played by Laurel and Hardy, enter the scene. They rent a room from the Old Woman and when they hear of her plight, they set out to help her. 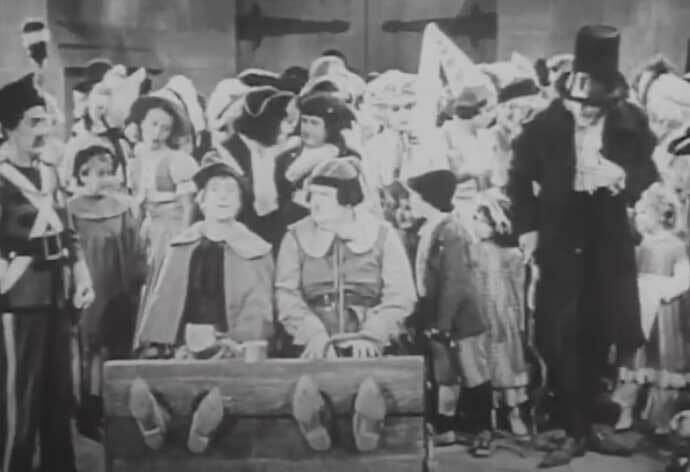 The rest of the movie centers around their attempts to help the Old Woman and save Bo Peep from marriage to the evil landlord. When it appears that they have been victorious in their efforts, the evil landlord goes to the underworld to gather his army of “Bogeymen”. “Bogeymen” for those who do not know, are imaginary creatures who terrify young children when they are put to bed and the lights are turned off. Then they emerge from their hiding places, under beds or in closets, and terrorize the young. They represent the hidden fears that all young children have. Laurel and Hardy had been fired from their jobs at the factory for having made 100 wooden soldiers that were 6 feet tall, rather than the 600 one foot soldiers that Santa Claus had ordered. It is these six food wooden soldiers that they unleash on the army of Bogeymen. They become human and, with the aid of Laurel and Hardy, defeat the army of Bogeymen and save the people from destruction. So, it turns out that the poor and bumbling “fools” become the heroes of the story, and their “mistake” – the huge wooden soldiers, are transformed into the necessary saviors of the people. When I had perceived what I considered to be the subliminal messages present in the film, I set out to learn more about Hal Roach the man. Was he in fact, a closeted socialist or communist? Was he preaching revolution? I was shocked and surprised by what I learned about him and his political inclinations. He was certainly from the working class. His parents had been Irish Immigrants and early in his long and successful life he had worked as a mule skinner, prospector, and cowboy of sorts, before he became a famous Hollywood producer known for his ever-popular shorts featuring Laurel and Hardy, as well as for his much loved “Our Gang” comedies. However, sometime in the mid 1930’s when he had become one of Hollywood’s most distinguished producers, he developed a personal relationship with Benito Mussolini. After he received assurances from Mussolini that Italy was it going to persecute Jews, he established a business relationship with him and his film empire, Cinecitta. However, Roach was no Fascist himself, and when Italy began to turn against the Jews, Roach broke his relationship with Mussolini. Yet and still, I am left pondering how it is possible, that this man who seemed to have no inclination to lean to the left, produced a movie which exposed the conditions of the working class, of single mothers, of women, and wrapped them all up in a movie that ends with the triumph of good over evil, of courage over fear. Perhaps it was just the that even in a movie made for children about a fairyland peopled by storybook characters, reality imposed itself upon and shaped fantasy.